Cast iron pans are a favorite of many a great chefs. I never owned one; but in culinary school used them and I learned a thing or two. And a few weeks ago, KaTom Restaurant Supplies offered to send me a cast iron skillet to use and review and I said I would love to. 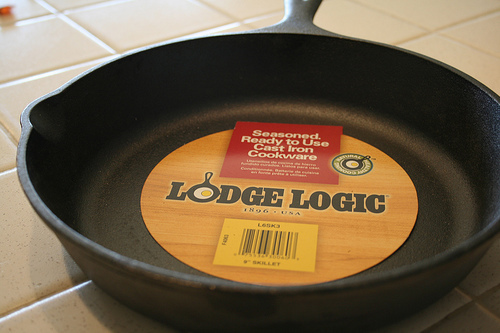 Because I really do want to add a cast iron skillet to my kitchen repertoire. They are infinitely useful for cooking crepes and eggs, the key is to care for them properly. 1. it is HEAVY 2. it is slow to conduct heat but once hot distributes heat evenly and steadily; perfect when you are cooking foods that need temperature maintained (pan frying, searing, baking, braising) 3. don't wash in the dishwasher 4. it transfers easily from stove to to the oven (and broiler) 5. the handle will get hot, too. 6. it is great for making eggs, omelets, crepes, corn bread, etc. 7. it is essential that you season it properly and as needed. Or it will rust. 8. it is essential that you clean it and store it properly. Or it will rust. 9. don't mix acidic foods with your cast iron skillet, as it will create an off flavor. Acidic foods: citrus, tomatoes, vinegar, wine. 10. cast iron responds slowly to heat change---keep this in mind if you need to quickly adjust temps for meats, sauces, etc. Option 1: With paper towel or clean cloth, rub entire skillet (handle included) with thin film of vegetable oil. Place upside down in 350 oven for an hour (place rack below with foil to catch any oil). Turn off oven and let cool. Repeat as needed. Option 2: Place a large amount of course salt (1 cup or more, depending on size of pan) plus enough vegetable oil to almost form a paste. Heat over burner until is smokes, remove from burner, shift salt around inside of pan and discard. Repeat as needed (aka if your skillet is no longer 'nonstick' you should repeat this process. The salt fills in the 'cracks' to create a smooth surface). Option 1: wipe with lightly oiled paper towel, store with dry paper towel lining skillet. Option 2: sprinkle with coarse salt and rub with dry paper towel. If you HAVE to use mild soapy water to clean, re-season it right away (set over heat to fully dry skillet, while warm, rub with tiny amount of vegetable oil and paper towel.